Among the human copper-containing monooxygenases, Tyrosinase (Ty) is an important enzyme involved in the determinant step of the biosynthetic pathway of melanin pigment. In this pathway, Ty catalyzes the tyrosine monooxygenation into L-DOPA-quinone, which is the precursor of the skin pigment melanin. Ty inhibitors/activators are a well-established approach for controlling in vivo melanin production, so their development has a huge economical and industrial impact. 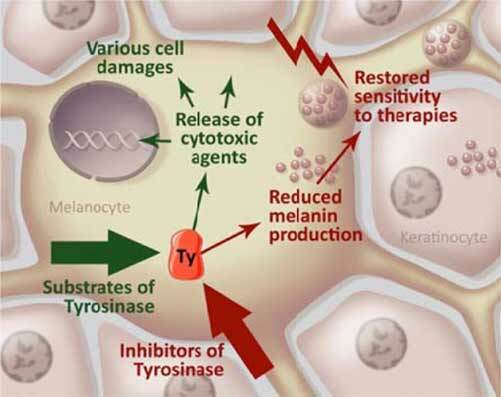 Moreover, recent publications highlight that targeting tyrosinase with inhibitors/activators to treat melanogenesis disorders is one of many possible approaches, due to the complex biochemical reaction involved in the melanin synthesis. Melanoma, Tyrosinase, TRP-1, TRP-2, Tyrosinase effectors. ISM2 UMR CNRS 7313, Centre Scientifique de Saint Jérôme, Aix Marseille Université, 13397, Marseille cedex 20, France.